TwistedBrush operates much like a real sketchbook. 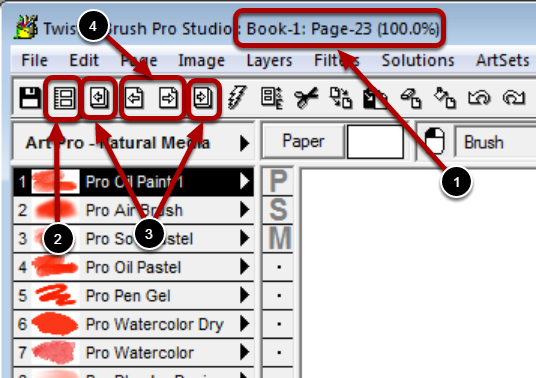 When you start TwistedBrush, it is like opening your sketchbook, it is immediately ready for you to work on your page. When you are done with a page you turn to the next page, you never need to manually save your work. But of course you can export your pictures to any number of standard image formats such as JPEG, PNG, BMP, TGA, TIFF, GIF, etc. On the title bar is displayed your current Book number and Page number. This is icon to launch the Page Explorer. These icons move to the previous and next book in your library. These icons move to the previous and next page in your current book.